Follow the spine-tingling, nighttime paddle and ghost hunting adventures of Tony & Petula Fera, authors of the Let’s Discover ON travel blog, and their Haudenosaunee guides. Do you believe in ghosts? These first time ghost hunters were skeptics at first, but after participating in the unique paranormal experience, Whisper to The Moon, they think and believe otherwise. The tour is hosted by a real-life ghost hunting team, S.N.I.P.E., (Six Nations Investigates Paranormal Encounters) and starts with a rafting trip on the Grand River under the stars. 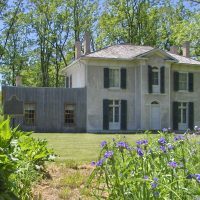 It concludes with a paranormal encounter at Six Nations’ Chiefswood National Historic Site, the old pre-confederate mansion of Mohawk Poetess, Pauline Johnson. Click here to read the full blog from Let’s Discover ON. Whisper to The Moon Paranormal Paddle is an entertaining and educational experience offered by Grand River Rafting Company and held on the Six Nations of the Grand River territory. For pricing, tour dates and times click here. Turbo tubing on the Grand River is fun and relaxing. New to paddling? Pick up an oar and dip in!